Hello and happy March – my goodness time does seem to be flying by! I’m so pleased to let you know that the second batch of Black Isle Yarns is ready (I think it will be referred to as Spring 2017). I picked it up from Juliet and John of The Border Mill in Edinburgh last Thursday when they very kindly took a break from setting up their Edinburgh Yarn Fest stand to handover and chat about this latest batch (and plans for the next). I’ve been looking forward to seeing these yarns for what feels like such a long time now. The first fleeces were bought, and carefully stashed in our gardening shed, at the end of last summer. And gradually, over the autumn months, more and more fleeces were added until I delivered a load down to Juliet and John in early January. We had a planning phone call in mid February, to work out the specific yarns weights and blends, and they worked at high speed to have the yarn ready so they could bring it all up to Edinburgh for me last week. I’ll introduce the farms, and sheep, who kindly grew the fleeces in another newsletter and keep this as an introduction to the yarns themselves – otherwise this will turn into a not-so-small novel. Very sadly the mill was unable to cope with the Ryeland fleeces which I talked about last autumn – their staple length is just too short for the particular set-up that The Border Mill has. Perhaps at some future date I’ll be able to work with their beautiful fleece, but for now that plan is on hold. I posted this photo on Instagram a few days ago – do you use Instagram? I really enjoy it as a way to connect with lots of other like-minded people. I post quite regularly so it is a good way to keep up with what I’m up to. If you click the photo you’ll open up my account – have a wee look, there’s usually lots of lovely Black Isle and Highland scenery as well as my latest wool and craft snippets. 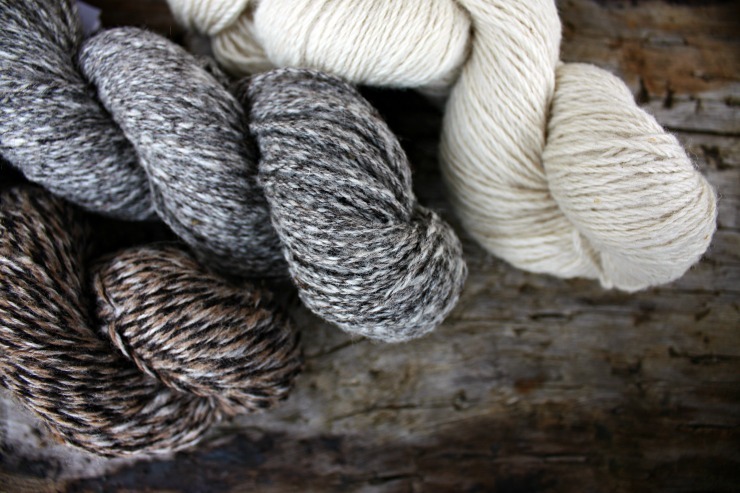 The first set of yarns is some absolutely gorgeous Shetland in a range of natural colours and white. The coloured fleeces in particular were extremely soft – to the extent that they were dubbed as ‘scary fine’ by Juliet. They posed a real challenge to the mill and weren’t able to go through the separator (which helps remove bits of vegetation and dirt) as it would have shredded the fine fibres, so they have been washed and tumbled multiple times instead. All the extra effort and care has been very worthwhile as the yarn is beautiful. I’m very grateful to the mill for adapting their process and treating each set of fleeces in the best way possible. Three different yarns have been spun all at approx Light DK weight. The first is a beautiful barberpole variegated with three plies one each of charcoal, fawn and white. The second is a heathered grey and finally there is a simple natural white. All three will work well together and all should take dye beautifully too. The next set of fleeces came from a lovely small farm with a very eclectic flock. As well as some very high quality cheviot (which I’ll talk about below) I picked out some special, rather unique, fleeces. Needles to say there’s only fairly small quantities of each of these yarns. 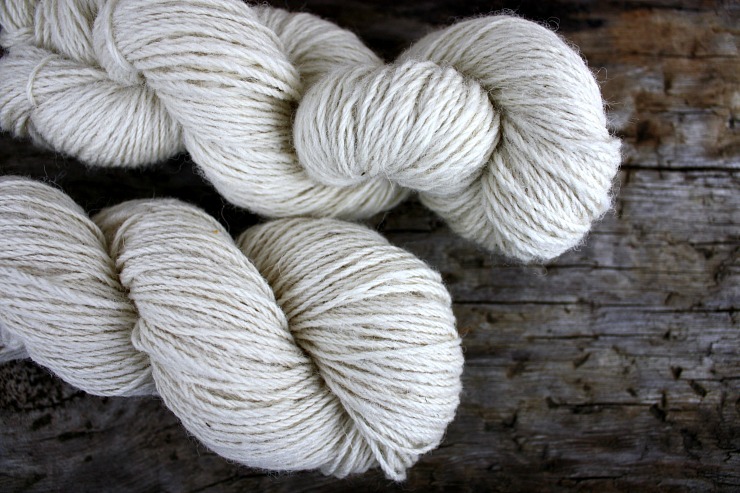 They have been spun at an approx 2-ply weight. Monkeyface is rather uncertain of her origin, she looks somewhat Hebridean but her fleece doesn’t bear too much resemblance to that fairly hardy fleece type, instead it is soft and lustrous with a lot of character (and the occasional Hebridean-like guard hair). Now that I have seen it spun I wonder if she may be a Heb-Gotland cross with a fleece that takes after her Gotland ancestry. The resulting yarn is a very dark charcoal black with just a hint of brown. Frankenstein has a multi-coloured fleece which perhaps reflects her muli-breed background of Bluefaced Leicester-Cotswold-Cheviot. 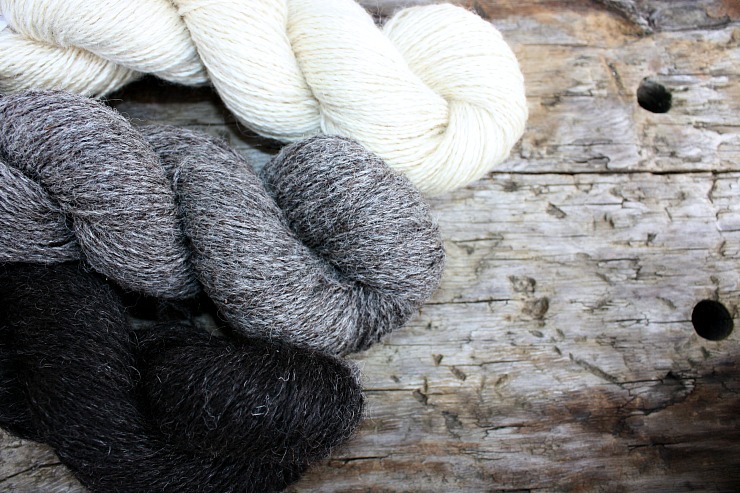 The spun wool is a warm grey/brown and, though not quite so soft, has a gentle lustre. The final ewe doesn’t have her own name, poor thing, but is a Blueface Leicester-Cotswold cross and her fleece has made a lovely soft, lustrous white yarn. Again, all three yarns will work together and I think would make a superb shawl. The Cheviot fleeces have been spun as two different yarns, both at Light DK weight so that they can be combined with the Shetland yarns. The only blend in this time is a 50:50% mix of Shetland~Cheviot. I have some mordanting in the dye pot at the moment and I think it is going to dye beautifully. The blend retains much of the softness of the Shetland but gains from the strength of the Cheviot. It should be a very adaptable yarn. And finally, the last yarn for Spring 2017 is pure Cheviot. John and Juliet were very complimentary about the quality of the Cheviot fleeces which I think must reflect on excellent husbandry from Jane – who I’ll introduce next time! I’ve just had a lovely weekend at Dornoch Fibre Fest and thoroighly enjoyed meeting lots of fantastic woolly people! Now that I’m back from the show I’ll settle down and work out my plans for releasing this batch. I am hoping to work with a couple of designers to develop a pattern or two written specifically for these yarns, which may mean that not all are going to be available on-line straight-away. They will get there eventually but there may be a slight delay while the designers work their magic……….but, of course, I’ll let you know what is happening and will ensure first notice will come out by newsletter (do join if you aren’t already, there’s a wee box on my homepage). I’ll be back before long to introduce the sheep and farms who grew this latest lot of wool. 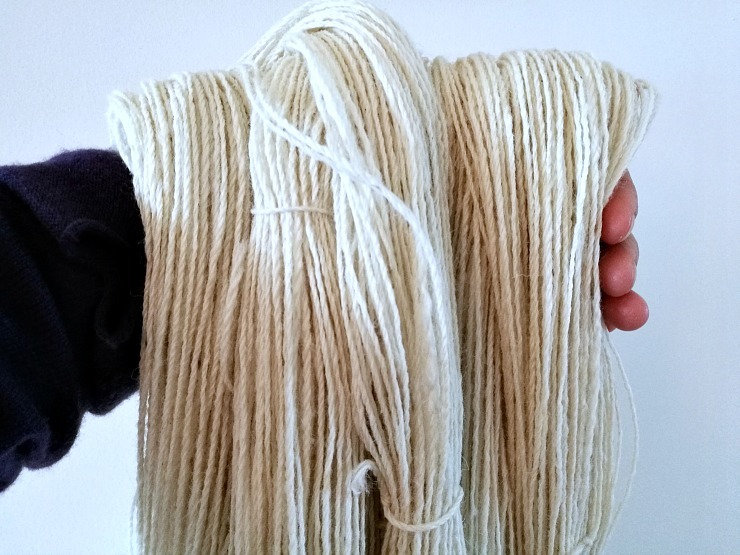 Blog and our Latest News, spring 2017bluefaced leicester cotswold, bluefaced leicester cotswold cheviot, cheviot, hebridean gotland, shetland, shetland cheviot, spring 2017, undyed5 Comments on Spring 2017 – Batch Number 2!